This is one amazing CD player, handsome looking with excellent build quality and sounding great. The sound produced by this CD player is very dynamic and rich in details. Cymbals sounds very realistic. Vocals sound natural and image portrayal has a very sharp focus. The bass has good kicks and extended. 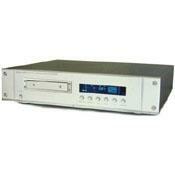 It is also one of the fastest-loading CD player that I have ever known. The CD text feature is also a plus. It can function well as a transport too.